The first performance of Claudio Monteverdi’s opera Arianna took place in 1608. The plot of the story derives from the Greek myth of the hero Theseus who with the help of the Cretan princess Ariadne (Ital. Arianna) defeats the monster Minotaurus and wins her love. While returning to Athens nevertheless, Theseus disdainfully abandons his love on the island Naxos. The realisation of the bass line has been kept very simple. It is intended as a harmonic support which can serve as a base for various possible continuo instruments (harpsichord, chest-organ, theorbo or lute). The bass figuration added by the editor in brackets is merely a suggestion. It is not surprising that the harmonic ‘results’ of his five-part madrigal version that was published in 1614 – nine years before the Lamento was printed – are not included in the later print: the five-part version demanded a more marked harmonic and rhythmic profile than the original, in which the recitative performance of the solo voice could be supported merely by long sustained bass notes. Martina Schänzle has translated the Italian text into German with the assistance of the editor. We thank Mrs. Dr. Maria Grazia Kölling, Hamburg, for extra help and advice. 2) “Lamento / d’Ariana / del Signor / Claudio Monteverde / Maestro di Capella / Della Serenissima Republica / … / Stampa del Gardano / in Venetia MDCXXIII / Appresso Bartolomeo Magni.“ (Ariadne’s lament by Mr. Claudio Monteverdi, maestro di capella of the republic of Venice … printed by Gardano in Venice 1623, obtainable at Bartolomeo Magni.) 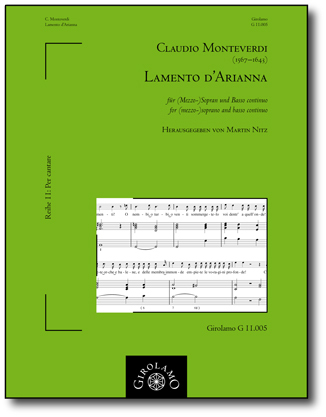 According to Claudio Gallico (I due pianti d’Arianna di Claudio Monteverdi in: Chigiana XXIV, 1967, p. 30) the Lamento was accompanied by violins and violas at the first performance. Between several sections of the surviving libretto there appears a chorus to whose words the music has also been lost. will leave her bones denuded. you would return your prow shorewards again. you sail on happily, while I remain here weeping. a prey to wild beasts on these solitary shores. oh mother, oh my father. with which you adorn my hair? the diamonds and the gold? for the beast to tear up and devour? who trusted you and gave you glory and life? Ah, that you do not even reply! Ah, that your are deaf to my laments! submerge him in those waves. What am I saying? Ah, what am I raving about? Wretched that I am, what am I asking? it was my tongue but not my heart. the fire of love is not put out. For that put out now, death, the unworthy flames. where my golden cradle stood! and for his betraying me.